A deeper understanding of ‘business experimentation for sustainability’ is needed to understand how evidence-based actionable knowledge can be created, in order to solve urgent sustainability challenges. Research is needed to understand the ‘business experimentation for sustainability’ concept; ways in which such experiments can be implemented; and how it can help accelerate sustainability transitions in business. The purpose of this Journal of Cleaner Production special issue on ‘Business Experimentation for Sustainability’ is to start addressing this important gap in the sustainable business research. The full list of potential research questions and call for papers on the Journal of Cleaner Production website can be found here. This call for papers is also posted onto the sustainable business model group blog. ANTIKAINEN, M., AMINOFF, A., PALOHEIMO, H. & KETTUNEN, O. 2017. 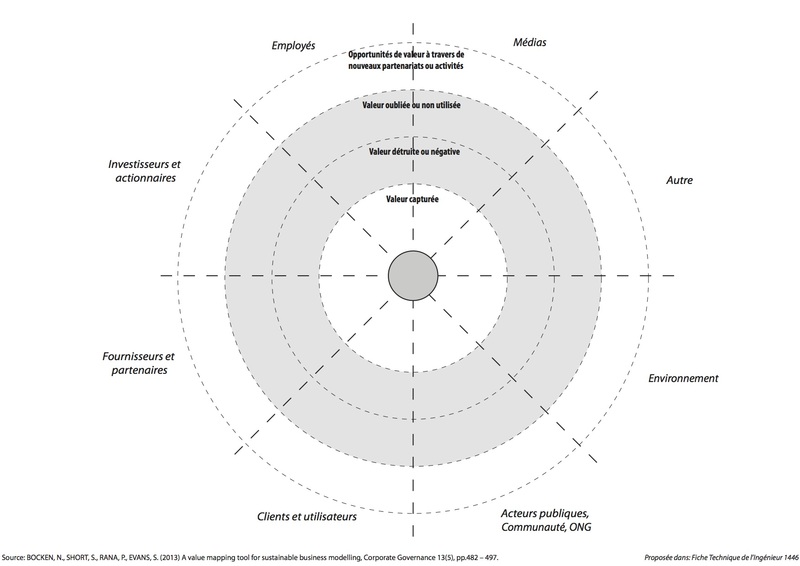 Designing circular business model experimentation – Case study. The proceedings of The ISPIM Innovation Forum, Toronto, Canada on 19-22 March 2017. HILDÉN, M. J., ANDREW HUITEMA, DAVE 2017. Special issue on experimentation for climate change solutions editorial: The search for climate change and sustainability solutions – The promise and the pitfalls of experimentation. Journal of Cleaner Production, 169, 1-7. There are high expectations on business models as ways to drive sustainable development. Various ‘sharing business models’ have emerged, some with a pure business intent, but others more clearly oriented towards societal and environmental benefits. The actual impacts of new sharing business models on society, the environment and the economy are debatable, and may in some cases even be adverse. It is clear that sharing business models need to be more clearly understood. A new way of investigating the real impact of sharing business models is the ‘ecologies of business models’ approach, which analyses the symbiotic and competitive relations between new and existing business models. This approach is presented in Boons & Bocken (in press). The ‘ecologies of business models’ is based on dynamics in nature, to advance understanding of how new business models reinforce existing ones or jeopardise these. This will help us assess the real impact of new business models by understanding the interlinkages between various new and old business models. E.g. : To what extent does a car sharing business model reduce the total number of cars on the road, or sustain car sales? To what extent do clothing sharing business models prevent new clothing sales and reduce the actual amount of clothes being produced? An overview of the types of relationships is shown in Table 1. Knowing the relationships between different business models, e.g. whether they are in competition or symbiotic, will facilitate the understanding of whether such business models live up to expectations. For example: do car sharing business models really prevent new cars from being built, or, do they sustain our car dependencies through sustaining our car dependencies? This research has clear implications for understanding ‘wider systems change’, for example, the transition to a Circular Economy or understanding the interplays between stakeholders and businesses to transition to sustainable cities, which deals with issues around mobility and ‘livability’. Further work building on this approach is in progress. Boons, F.,Bocken, N., 2018. Towards a sharing economy – innovating ecologies of business models. Technological Forecasting & Social Change (in press). Authors own copy (accepted version not edited by the journal) available here. 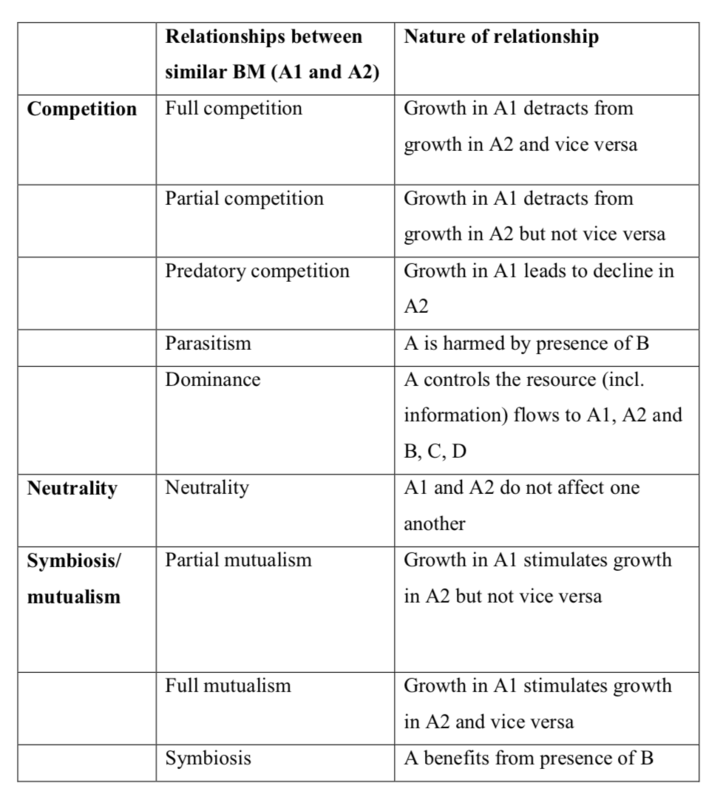 Boons, F.,Bocken, N. Assessing the sharing economy: analyzing ecologies of business models. In: Bakker, C. A., & Mugge, R. (Eds.). (2017). PLATE: Product Lifetimes And The Environment: Conference Proceedings of PLATE 2017, 8-10 November 2017, Delft, the Netherlands(Vol. 9). Ios Press. From 2016 to 2017, we conducted action research with eight case studies at Delft University of Technology, in collaboration with a societal and environmental purpose-driven innovation consultancy firm, Innoboost, both based in the Netherlands. The objective of this collaborative project, ‘Kickstarting circular business experimentation’, was to help eight case companies transition to profitable circular business models through experimentation. Process: The case studies showed that there is a certain sequence in steps, but companies tend to go back-and-fourth between steps, for example, going back to the business purpose or redoing a value proposition experiment. Circular business experimentation tends to be an iterative process rather than a linear checklist type of approach. Role of experimentation: The cases showed that experimentation could serve as a way to create internal and external traction for a sustainability transition. Tracking progress against sustainability goals was found to be an important part of the experimentation process in addition to the need to move from experiments to scaling up. 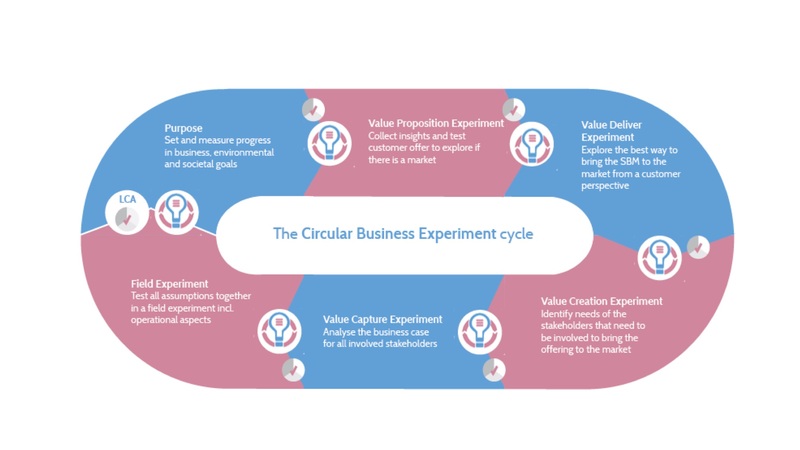 In the journal paper, we also develop a “Circular Business Experiment Cycle”, which shows a potential sequence of experiments, starting with the business purpose and sustainable value proposition. In contrast to just ‘making money’, the business purpose for a sustainable business includes clear societal and environmental goals. A value proposition experiment then focuses on the customer viability of the product/service offering. Value delivery experiments focus on customer relationships, customer segments and channels. Other stakeholders, such as local community representatives (‘society’) or environmental NGOs (‘environment’) can get involved in these experiments to test whether and how the business can create and capture wider societal and environmental value. Value creation and value capture experiments are about including stakeholders to operationalise the business model, and developing the business case for all stakeholders involved respectively. Finally, a field experiment can test all assumptions together including operational aspects. The Circular Business Experiment Cycle includes “triple bottom line checks” (i.e., checks for sustainability performance, which can be done using something like the streamlined environmental value proposition approach) in addition to deliberate learning after each experiment. After the field experiment, a more thorough LCA could be performed to assess the full environmental impact. Figure. Circular Business Experiment Cycle. Developed in Bocken, Schuit and Kraaijenhagen (2018). Manninen, K., Koskela, S., Antikainen, R., Bocken, N., Dahlbo, H. and Aminoff, A., 2018. Do circular economy business models capture intended environmental value propositions?. Journal of Cleaner Production, 171, 413-422. The Circular Economy is now regarded as a key driver for sustainability by business, policy makers, and academia. Recently a special issue was dedicated to the phenomenon in Journal of Industrial Ecology , presenting tools, methods, opportunities and challenges associated with the Circular Economy as a driver for sustainability. We investigated how companies pursuing circular economy as part of their business can quickly assess their environmental value propositions and verify impact. This would lead to the identification of improvement proposals to help refine the value proposition for sustainability. The environmental value proposition framework can be found in Figure 1 below. Figure 1. 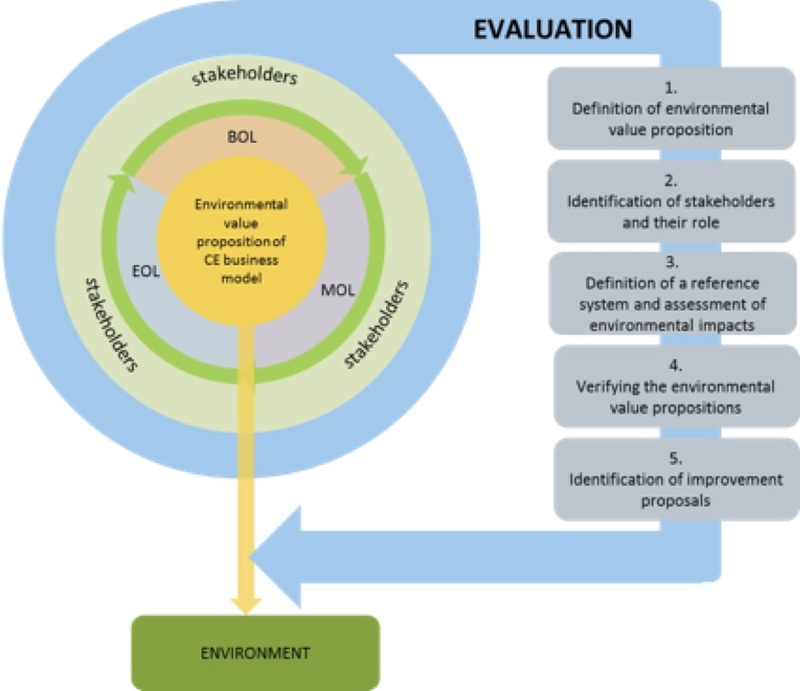 Environmental Value Proposition Evaluation framework. Source: Manninen et al. 2018. Note. BOL, MOL and EOL refer to Beginning, Middle and End of Product Life, referring to different stages in the product life cycle from material sourcing and extraction up until consumer use and reuse (and recycle etc). Start-up HOMIE, focused on driving sustainable consumption and pursuing circularity (e.g. long-lasting products, reuse, reparability and recycling) through a pay per use business model, starting with washing machines, is one of the case studies who applied the framework. All cases as well as the framework and an environmental value proposition table (EVPT) created by the authors can be found here (free to download using this link the upcoming 50 days). Bocken, N.M., Olivetti, E.A., Cullen, J.M., Potting, J. and Lifset, R., 2017. Taking the Circularity to the Next Level: A Special Issue on the Circular Economy. Journal of Industrial Ecology. Manninen, K., Koskela, S., Antikainen, R., Bocken, N., Dahlbo, H. and Aminoff, A., 2018. Do circular economy business models capture intended environmental value propositions?. Journal of Cleaner Production. Sustainable business model innovation is a hot topic, which has received increasing interest from businesses, academia, NGOs and policy makers as a promising way to create ‘systems-level change’ for sustainability. This work was intended to do a ‘reality check’ of the adoption of sustainable business models by the largest global corporations — those listed in the S&P 500 index — over the period 2005–2014. We examined press release communications during this period, which represent public data about business-relevant events. We used academic and practitioner expert panels to build a set of keywords across nine sustainable business model archetypes (Figure 1) and utilised automated content analysis to examine companies’ sustainable business activities and practices. Figure 1. Nine sustainable business model archetypes (Ritala et al., 2018 based on Bocken et al., 2014, 2016 and Lüdeke-Freund et al., 2016). One of the findings was that large capitalized firms have mostly adopted the environmentally-oriented archetypes, and to much lesser extent the societal and organizational ones. Difficult topics such as sufficiency and scaling up of sustainable business model innovation initiatives remain challenging in large business. Further detail about the analyses on types of business models pursued and trends can be found in our paper. Good food for thought for future work! Innovation relates to development of new products and services, processes (production methods and procedures), technologies, organizational practices and business models. As a field of inquiry innovation is broad and distinctions can be made between the diffusion and adoption of innovations in the market versus organizational innovating and innovativeness. Here, we regard innovation as a process of turning opportunity into new ideas and of putting these into widely used practice (Tidd, Bessant, & Pavitt, 2005). Innovation is vital for organizational survival, long-term growth, and the abilities in both incremental and radical innovation constitute a significant source of competitive advantage for organizations (Teece, 2010; Gunday et al., 2011). However, a growing number of organizations also aim to include both social and environmental aspects as part of their economic value creation, since they understand that long-term competitiveness can only be achieved this way (Hart & Milstein, 2003; Porter & Kramer, 2011). Indeed, for an increasing number of firms, sustainability implies the creation, delivery and capturing of all three dimensions of value – economic, social, and environmental – as part of their business model (see e.g. Boons et al., 2013; Bocken et al., 2014; Iñigo et al., 2017; Lüdeke-Freund et al., 2016). Accordingly, firms increasingly aim for sustainability-oriented innovation, rather than innovation as a solely profit-oriented pursuit (Adams et al., 2016) fostering complex transformation at the organizational level and society (Iñigo & Albareda, 2016). Here – we refer to sustainable innovation as both a process and an outcome of pursuits that increase economical, ecological and social aspects of value creation. Such innovation is all but easy, but when successful, the rewards are high for both innovating actors as well as the societies they are embedded in (e.g. Porter and Kramer, 2011; Eccless and Serafeim, 2013). This book – ‘Innovation for Sustainability’ – will start from the big picture, the vision of sustainable innovation, strategy and leadership to the measurement, tools, and metrics for sustainable innovation. We highlight the strategic, organizational, and individual aspects of sustainable innovation, as well as its practical implications. Each of the chapters includes a range of academic contributions to the topic plus related commentaries contrasting real experiences (chapter by chapter) explained by professionals, leaders, entrepreneurs and managers from different business and organisational contexts such as NGOs, social and sustainable enterprises and governmental bodies. Thus, it will provide an overarching outline of the contemporary issues in Innovation for Sustainability from academic, business and social perspectives. The aim of this edited book is to provide an overview of the main dimensions, challenges and opportunities of sustainable innovation. This edited book will combine work from researchers active in different academic fields with contributions from professionals and entrepreneurs who work with sustainable innovation. The book will be an edited volume in which the chapters are written by researchers, as well as experienced experts, to understand and implement sustainable innovation projects. The book aims to be a “solutions-driven” analysis and proposals fostering sustainable innovation towards a better world. Different chapters should be rather reflective and involve also a critical understanding of the challenges that need to be solved. This book aims to be a key resource for Master students, PhD student, MBAs, but also scholars, practitioners and decision makers wanting to gain essential advanced knowledge about the field of sustainable innovation. Key topics are the analysis of different approaches to sustainable innovation, sustainable business model innovation, strategy and leadership, corporate responsibility and philanthropy, measurement and assessment mechanisms, impacts, tools and methods. Researchers and practitioners individually or in teams are invited to submit on or before September 18, 2017, a 2-3 page manuscript proposal clearly explaining the topic and content of the proposed chapter (max. 1000 words including all). This can be delivered in the form of an extended abstract including initial outcomes, frameworks or tools and methods proposed, which may be visualized. Authors of accepted proposals will be notified about the status of their proposals as soon as possible (latest at 29 September) and at stage they will receive further chapter guidelines. Full chapters are due by December 15, 2017. All submitted chapters will be reviewed on a blind review basis. The book is scheduled to be published by Palgrave Macmillan in early 2019. The book will be published by Palgrave Macmillan and distributed worldwide. It will be part of the Palgrave Studies in Sustainable Business (in Association with Future Earth). The book will be published in hardback and ebook initially. It will also be included in Palgrave Macmillan’s Business and Management package on Springerlink, which is subscribed to by institutions around the world. The PDF of the call for chapters is downloadable here: Palgrave Macmillan Call for chapters_FINAL. The link to Palgrave Macmillan’s website with the call for chapters can be found here. Adams, R., Jeanrenaud, S., Bessant, J., Denyer, D., & Overy, P. (2016). 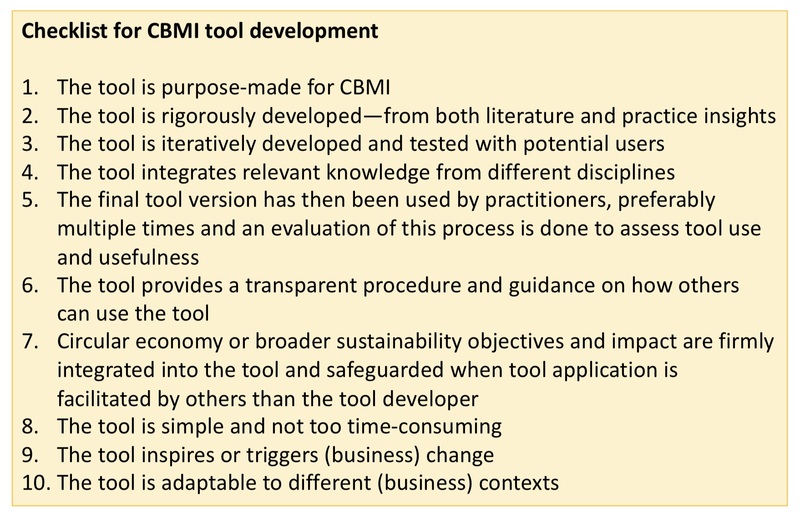 Sustainability‐oriented innovation: a systematic review. International Journal of Management Reviews, 18(2), 180-205. Boons, F., Montalvo, C., Quist, J. & Wagner, M. (2013). Sustainable innovation, business models and economic performance: an overview. Journal of Cleaner Production, 45, 1-8. Eccles, R. G., & Serafeim, G. (2013). The performance frontier. Harvard Business Review, 91(5), 50-60. Hart, S., & Milstein, M. (2003). Creating sustainable value. Academy of Management Executive , 17 (2), 56-67. Inigo, E. A., Albareda, L., & Ritala, P. (2017). Business model innovation for sustainability: exploring evolutionary and radical approaches through dynamic capabilities. Industry and Innovation, 24(5), 515-542. Iñigo, E. & Albareda, L. (2016). Understanding sustainable innovation as a complex adaptive system: A systemic approach to the firm. Journal of Cleaner Production, 126 (10): 1-20. Porter, M. & Kramer, M. R., (2011). Creating shared value. Harvard business review, 89(1/2), 62-77. Lüdeke-Freund, F., Massa, L., Bocken, N., Brent, A., & Musango, J. (2016). Business Models for Shared Value: How Sustainability-Oriented Business Models Contribute to Business Success and Societal Progress. Cape Town: Network for Business Sustainability South Africa. Tidd, J., Bessant, J. R., & Pavitt, K. (2005). Managing innovation: Integrating technological, market and organizational change (5th edition). Chichester: Wiley. PLATE aims to address the detrimental impacts of our consumption through considering product lifetimes, bringing together academic researchers, industry, and policy stakeholders working in the field of sustainability. In June 2015, the 1st PLATE (Product Lifetimes and the Environment) conference was convened by Prof. Tim Cooper at Nottingham Trent University in the UK with over 100 people attending. Given its success, we are pleased to inform you that PLATE is not only continuing, but also expanding internationally. The 2nd PLATE conference will be hosted from 8-10th November 2017 at the Faculty of Industrial Design Engineering of the Delft University of Technology in the Netherlands. The call for papers is now live on the PLATE website: http://www.plateconference.org/. The conference proceedings will be published as a Thomson Reuters and Scopus-indexed e-book with IOS Press (Delft University Press). A selection of papers will be invited for a special issue in The Design Journal. We encourage scholars and practitioners, at every level from graduate student to seasoned scholar, to begin now to plan your contribution to PLATE 2017. Please feel free to inform and invite other people who might be interested to submit an extended abstract. We still welcome workshop proposals. A call for these will be announced early 2017; in the meanwhile, we welcome queries and informal expressions of interest at plate2017@tudelft.nl. We look forward to seeing you in Delft, The Netherlands, in 2017! The Value Mapping Tool was developed to assist in ‘sustainable business modelling’ – the process of inventing new sustainable business model ideas. The process of using the tool, and the terminology of value captured, value missed, value destroyed and new value opportunities were introduced in the first journal paper and earlier conference paper about the value mapping tool. By first considering the value captured, value missed and value destroyed from the perspective of multiple stakeholders, the failed value exchanges in existing business models can be identified. “Environment” and “Society” analogous to the work by Stubbs and Cocklin (2008) are necessary stakeholders in the value mapping tool, next to the more familiar ones such as customers, the government and suppliers. The business is split up into its key stakeholders: employees and investors/ shareholders. Only after considering the value captured, missed and destroyed from these multiple stakeholder perspectives, new value opportunities should be sought that resolve failed value exchanges and create new forms of value through business model innovation. In this way, more value can be created for the whole value network, not only the firm and its customers. Since its development the value mapping tool has been used by researchers and people in businesses around the world, which has led to various translations. This post shares some of these. Courtesy of Dr Benjamin Tyl, the tool itself is now translated in French and the figure can be found below. The document guideline-value-mapping-tool-fiche-ti-1446 also developed by Benjamin includes an in-depth guide for practitioners in French with various new ideas. It is structured according to: The workshop process (split into 3 sessions); Advice; FAQ; and Next steps. Thanks for sharing your translated versions! Geißdörfer, M., Bocken, N.M.P., Hultink, E. 2016. Design thinking to enhance the sustainable business modelling process – a workshop based on a value mapping process, Journal of Cleaner Production, 135, 1218–1232.